Just like their human counterparts, dogs’ and cats’ bodies are around 70% water. For this reason, it’s vital to ensure that your pooch stays hydrated, and this means giving them easy access to clean water. You could use a standard bowl, but an increasing number of owners are opting for an alternative solution: pet water fountains. These handy devices provide your pet with running water, which studies show they prefer to drink from. If you’ve ever noticed a dog or cat drinking water from a dripping tap around the house, this is why – in the wild, running water is a much safer bet than still water, which can sometimes be stagnant. Doggie fountains are also a great way to give your pet access to water when you need to leave them alone, and ensuring the water they do drink is as fresh and appealing as possible. With so many benefits, it’s unsurprising that many petcare companies have made their own dog water fountain. To help you choose one, we’ve compiled a list of the top 10 fountains on the market right now. We’ve also included some important information about how to keep your pet properly hydrated, helping them to stay happy and healthy. Kicking off our list is PetSafe, with their multi-tier dog water fountain. Featuring a large water capacity of 100 ounces, it’s ideal for keeping larger canines well hydrated throughout the day. When in use, water constantly flows from the top tier to the bottom, creating an appealing hydration station for canine companions. The drinking fountain also features a carbon based filtration system, to keep the circulating water clean and fresh. The low voltage motor offers great efficiency, as well as running quietly so as not to distract you. The fountain’s BPA-free plastic is safe and easy to clean, too – in fact, you can simply pop it in the dishwasher. Since flowing water limits bacterial growth, though, you’ll probably need to clean in much less often than a standard water bowl. The elevated dish design makes it easier for senior pets to reach the water inside, while the appeal of flowing water encourages your animals to drink more. The next dog water dispenser to earn itself a spot on our list is Dogit Design’s offering. Their fountain provides pooches with a continuous source of fresh-tasting water, encouraging them to drink and stay hydrated. Its 200 fluid ounce capacity is copious enough to keep even large dogs hydrated all day long, while its clever filtration system prevents the water from going stale or stagnant. This system also prevents hair and other debris from finding its way into your pet’s drinking water. When in use, it’s virtually silent, and a slight gurgling noise will let you know that it’s time to top the fountain up. The shallow layer of water that flows over the fountain’s top plate means it’s unlikely to spill, and won’t result in longer haired breeds ending up with sopping wet faces every time they drink! This Petsafe drinkwell Platinum pet fountain is another hydration solution that has caught our attention. It provides dogs with a free-falling stream of water, improving oxygenation compared to a standard bowl. This constant circulation also inhibits bacterial growth, keeping water fresher for longer. The stream itself is adjustable, allowing you to adjust the pressure to meet your dog’s preferences. The fountain also incorporates a filtration system, which utilises natural carbon filters to remove bad tastes, odors, and debris. The large reservoir capacity ensures your pooch will stay hydrated throughout the day, and when the time comes to clean the fountain, you’ll find it easy to disassemble, and can simply be placed in the dishwasher. The product is also made from safe, durable, BPA-free plastic, so it’s designed to last for years to come. The next pet water dispenser to make our list is Lunvon’s 100 oz fountain. Water flows from the reservoir over the top plate, making it more appealing to pets and keeping it oxygenated and fresh-tasting. The fountain features three different settings; continuous operation, activation at 30 minute intervals, and activation for one to 10 seconds at adjustable intervals. Buttons located on the side of the device make changing between these settings easy. Not having water flow constantly is a great way to save energy, and emulate the water access your pet would have in the wild, too. A built-in filtration system removes chlorine and bacteria from the water, improving pet health. Canine and feline bodies, being smaller than our own, are more susceptible to the buildup of certain minerals found in our tap water, and this simple but effective filtration system keeps them at bay. When the fountain’s reservoir is running low, you’ll hear an audible alert, so you won’t need to worry about checking up on water levels constantly. The device is also incredibly quiet during operation, thanks to a muted pump and noise-cancelling water dispensation. Finally, the dispenser is really easy to clean; its design helps prevent spillages, and can be easily reassembled after cleaning thanks to parts that conveniently snap together. Bergan’s design is the perfect solution if you need a dog water fountain outdoors. This automatic dog waterer is carefully designed to provide access to fresh, safe drinking water when your pooch is playing outside. Its simple design can be hooked up to any garden hose with ease, making for a secure and convenient hydration method. The fountain features a float valve that cuts off the water supply when the reservoir is full, ensuring you won’t experience any overflow onto your patio or lawn. It’s also equipped with mounting tabs on the back of the dish, allowing it to be easily mounted to a wall or floor. For pooches who enjoy relaxing outdoors in hot climates, this fountain is a simple and effective way to make sure they’re accessing the cool, fresh water they need to stay healthy. PetSafe have earned their third and final spot on our list with this attractive and functional stainless steel pet fountain. It features a bowl with a raised fountain and five free-falling streams, each of which has an adjustable flow control cap, to customise the pressure. You can also turn each of the taps on and off, to find the right balance for your dog. The fountain also includes a replaceable carbon filter, designed to remove bad odors and tastes, and keeping the water extra fresh. Its 360 degree construction makes it perfect for multi-pet households, since more than one canine can drink at once. Because it’s made from rust resistant and durable stainless steel, the fountain is long-lasting and easy to clean too. You can take it apart easily, and put in the dishwasher for safe and effective maintenance. The raised streams make it easy for pets to drink – especially larger animals – while the constant water circulation prevents bacterial growth. The fountain operates quietly thanks to its efficient electric pump. For smaller pooches, this compact Raindrop style drinking fountain could be the perfect option. It’s attractive design, shaped like a water droplet, circulates your pet’s drinking water through a shallow channel, making it more appealing to them. The fountain also includes a charcoal filtration system, keeping the 60 ounces of water contained in the reservoir fresh and clean at all times. This drinking fountain is made from high grade stainless steel, so it’s built to last and dishwasher safe. The ultra-quiet pump ensures that water is circulated as smoothly as possible, preventing any irritating noise from entering your home. The sleek design is tailored to compliment almost any interior, while the smooth surface prevents bacteria growth. Petacc’s fun and colorful design really sets their water fountain apart from other options on the market. The fountain’s green color scheme was chosen deliberately, as it’s one of the easiest colors for cats and dogs to perceive. It features a flower-shaped water spout, from which multiple streams flow, allowing more than one pet to drink at once. In fact, the fountain is suitable for a whole host of creatures great and small, including hamsters and birds as well as cats and dogs. By moving water constantly, the fountain increases its appeal, and prevents it from going stagnant. This effort is helped by a built-in filtration system, built around a high-density activated charcoal core. This filter removes dirt and hair from the water, as well as some of the main minerals dissolved in tap water. Constructed from food-grade, BPA-free resin, the fountain is easy to clean. Each piece needs little more than a regular rinse to stay in tip top condition. Finally, it’s quiet to use, thanks to a muted motor boasting an impressively low power consumption. As their name suggests, H20 Animal Hydration are experts when it comes to keeping pets hydrated. Their Automatic Waterer is perfect for outdoor use, and can be easily attached to any garden hose to offer pooches a constant flow of cool, clean water. The bowl features a high-density polypropylene cover, protecting the water inside from falling debris, while still providing the largest drinking area for products of its kind. 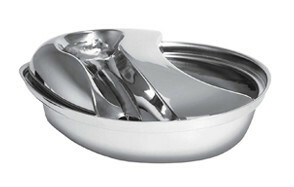 Both dogs and cats will find the bowl attractive and easy to drink from, but it can also be used to satiate the thirst of larger animals, such as sheep and goats. Last, but not least, we have Uniclife’s electric drinking fountain. The cube-shaped design, featuring an LED light, could almost be at home in a spa, and will look great in almost any home. It consists of a reservoir, bowl, and one free-falling water stream. The water within is constantly circulated, preventing stagnation and improving its appeal for pets. The fountain’s flow rate can be easily adjusted, so you can find the pressure that’s right for your pooch. Meanwhile, a blue LED light mounted just behind the stream makes it easy for dogs to find, encouraging them to drink more. It’s made from durable, BPA-free plastic, which is non-toxic, odorless, and easy to clean. Within the reservoir, carbon filter technology keeps water clean and fresh by removing hair, dirt, and other debris, as well as bad tastes that could put pets off. 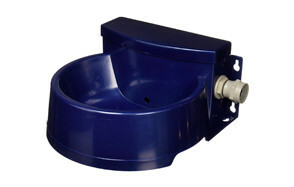 The low voltage motor ensures the fountain runs quietly and efficiently. Producing less than 35 decibels, the fountain is literally as quiet as a whisper. All the fountains on our list have been curated for quality, so you can rest assured you’ll be purchasing a reliable product whichever one you choose. Below we run through some factors to bear in mind when purchasing a drinking fountain, and how to keep it in good condition. Because proper hydration plays such a vital role in keeping pooches healthy, we’ve also compiled some useful information about what dehydration looks like, and how it can be prevented. The first question you’ll need to answer when choosing a dog water fountain is whether you’ll be using it for indoors or out. Outdoor designs don’t tend to be fountains per se - instead, they replenish water as your dog drinks, and are typically attached to a garden hose. Indoor fountains do have flowing water, and depend on a mains outlet for power. The next factor to bear in mind is water capacity. How much you need the reservoir to hold depends on how many animals will be using it, and how large they are. As a rule of thumb, healthy dogs should drink about an ounce of water per pound of body weight per day. With this in mind, you’ll notice that many of the fountains here have capacities large enough to support your dog for several days without topping up. Dog water fountains tend to made from plastic or stainless steel. Stainless steel designs are little heavier and more durable, but can be a more expensive to purchase. Whichever material you choose, though, you can rest assured it’s non-toxic and safe. That being said, if your pup is a chewer, investing in steel might be a good call! Another factor to consider when buying a water fountain is how loud it will be. If you need to keep it in a room that you frequently occupy, look out for low voltage pumps, and models designed to run quietly so as not to be bothered by the noise. Replacing your dog’s water bowl with a drinking fountain can encourage them to drink more and prevent dehydration, which can be a serious problem resulting in kidney failure, heat stroke, or even death. If you suspect your dog is dehydrated, encourage them to drink. If they refuse to do so, it’s vital to contact your vet as soon as possible. 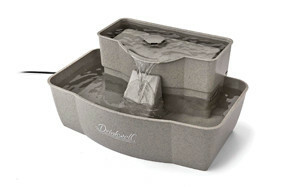 For us, the best dog water fountain on the market right now is PetSafe’s famous drinkwell fountain. Its attractive, multi-tier design allows multiple pets to drink side by side comfortably, and its raised top tier is especially convenient for senior dogs who are less able to bend low. Its substantial 100 ounce water capacity will keep pets hydrated all day, so you won’t need to worry if they’ll have enough to drink whenever you head out the house. The free-falling stream encourages pets to drink more, which can prevent a whole host of health problems down the line. Constantly circulating water not only tastes better to dogs and cats, it’s also far less likely to harbor harmful bacteria. This fountain’s built-in filtration system ensures the water within is even safer, by removing hair and dirt, as well as removing bad tastes and smells. Thanks to its quiet motor, you’ll barely even notice it’s running. PetSafe have been helping pooches stay happy and healthy since 1991, and they’ve channeled that experience into this fountain to great acclaim.